Variety's David Rubinoff, Comedy's Red Skelton and Drama's "Screen Guild Players" (Peggy Cummins & Ronald Colman) represent the program categories that were the most popular in each of the eras. Network Radio's Golden Age can be divided into three, seven year periods, each with its own distinctive characteristics. The Depression Years, (1932-33 to 1938-39), represent Network Radio’s emergence as a dominant media power. The World War II Years, (1939-40 to 1945-46), were its peak in popularity and revenues. Network Radio’s abdication to television as the major electronic medium took place in the Postwar Years, (1946-47 to 1952-53). 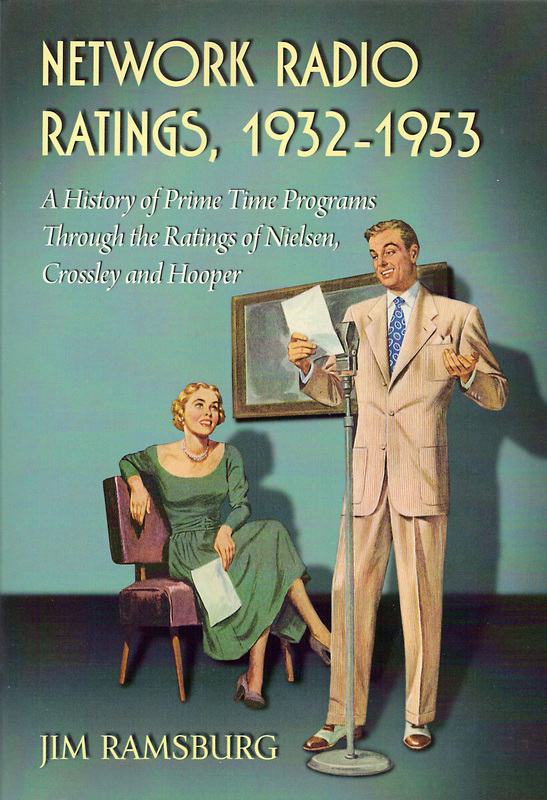 A point system based on the Annual Top 50 programs from Network Radio Ratings, 1932-1953, allows us to break out the Top 50 from each seven year period and learn what shows and types of programs listeners wanted to hear most during each of them, and to a degree, reflecting the mood of the country. A review of each of the eras follows the the listings. A total of 103 separate programs or personalities registered in one or more of the three Top 50 lists. In many cases the personalities involved headlined different programs of similar formats so only their names are used. The Depression Era: 1932-33 to 1938-39: The Top 50 from early years of the Golden Age were dominated by a sub-category - the 24 Variety shows in which the singing or comic host introduced acts much as they did in the stage shows they headlined between movies in large theaters around the country. Six of the era’s Top Seven shows were this kind of Network Radio’s adaptation of vaudeville and a throwback to happier times. Nineteen of the Top 50 were Music oriented shows led by popular singers Rudy Vallee, Bing Crosby and Al Jolson in the Top Ten. And, although classified as Talent Competition, Major Bowes’ Original Amateur Hour was another Top Ten entry that was dominated by musical acts. Generational differences can be seen in the short-lived popularity of the Classical/Semi Classical and Standard/Traditional Music formats which faded in the late 1930’s as did the Minstrel offerings of Maxwell House Showboat, The Sinclair Minstrels and segments between Pick Malone & Pat Padgett’s blackface comedy routines on The Model Minstrels. Close behind Music were the 17 Comedy entries led by the Depression era’s most popular comedian, Eddie Cantor. Only three of this genre were Situation Comedies - Amos & Andy, Fibber McGee & Molly and Jack Benny’s programs which evolved during the 1930’s from a Variety show to a character driven sitcom. Benny proved to be ahead of his time. Together, this 78% of the period’s Top 50 represent light-hearted escapism - a tonic America wanted at a time when unemployment was common and war became increasingly imminent in Europe and Asia. 40 Can You Top This? The World War II Years: 1939-40 to 1945-46. Twenty-six new programs/personalities entered the period’s Top 50 - a turnover rate of 52%. Eight of the Top Ten were new to that list. Although newcomer Bob Hope’s Comedy/Variety show led the pack, the overall number of Variety shows in the Top 50 shrunk from 24 to 13 as more specialized formats emerged. Comedy took over as the most popular format of the period. America need some good laughs during the war and Network Radio was happy to provide them to both the home audience and the growing number of listeners tuned to Armed Forces Radio. Twenty-three of the Top 50 entries fell under the Comedy umbrella, including Panel Shows Can You Top This and Information Please, and the growing number of ten situation comedies led by Fibber McGee & Molly and The Aldrich Family. Further down the list, Burns & Allen converted their variety format into a sitcom as Jack Benny did in the mid-1930’s. The Comedy total rises to 27 with the addition of Audience Participation Stunt shows Truth Or Consequences and People Are Funny, and Audience Participation Quizzes, Kay Kyser’s Kollege of Musical Knowledge and Take It Or Leave It, which were all played for laughs. And this tally doesn’t include the frequent comedy segments of the Bing Crosby, Kate Smith, Rudy Vallee and Dinah Shore Music/Variety shows. The biggest category loser of the seven year period was Music which shrunk from 19 to only eight of the Top 50. The emergence of contemporary music’s popularity with listeners was evidenced by the ranking of Fitch Bandwagon in the era’s Top 10, Your Hit Parade in 20th place and the liberal doses of 1940’s swing offered during Kay Kyser’s Kollege of Musical Knowledge Audience Participation Quiz. Shows headlined by singers Bing Crosby, Kate Smith, Rudy Vallee, Dinah Shore and bandleader Guy Lombardo made up for the loss of audience suffered by formats offering Classical/Semi Classical, Standard/Traditional and ethnic music that were popular during earlier days. The number of News programs increased significantly during World War II but they didn‘t make much of a dent in the Top 50. Walter Winchell and Lowell Thomas were holdovers from the Depression Era and only H.V Kaltenborn was added to the list during the duration. Although the nightly newscasts of Bill Henry on CBS, Mutual’s Gabriel Heatter and John W. Vandercook’s NBC News of The World were heard by millions, they didn’t attract the audience necessary to rank among the period’s Top 50 programs. The Postwar/Early TV Years: 1946-47 - 1952-53. Twenty-seven new programs found places in the Postwar era’s Top 50 - a 54% turnover from the previous seven year period. But only four new entries invaded the Top Ten - including the veteran Amos & Andy which made a major comeback as a weekly half-hour sitcom after its nightly serial format suffered a downturn in popularity. Radio drama boomed after World War II. The number of Dramatic Anthologies and Dramatic series with Continuing Characters more than doubled from the previous era. Twenty-one of the period’s Top 50 programs were dramas ranging from the star-studded Lux Radio Theater and prestigious Theater Guild On The Air to the formulaic Mr. Keen, Tracer of Lost Persons and Gangbusters. The number of Situation Comedies grew from ten to 16 and the number of Comedy shows remained strong at 20. The Comedy total grows to 24 with the addition of Audience Participation shows People Are Funny, Truth Or Consequences, Groucho Marx’s You Bet Your Life and Bob Hawk's comedy quiz. .
Music was the biggest loser of popularity in the postwar years. Only the musically dominated Talent Competitions presented by Arthur Godfrey’s Talent Scouts and Horace Heidt’s Youth Opportunity Program plus Bing Crosby and Your Hit Parade managed Top 50 finishes. Spot checking these three lists, only twelve entries made the Top 50 in all three eras: Amos & Andy, Big Town, Bing Crosby, Burns & Allen, Edgar Bergen & Charlie McCarthy, Fanny Brice, Fibber McGee & Molly, Fred Allen, Jack Benny, Lux Radio Theater, Walter Winchell and Your Hit Parade. Another 22 made the Top 50 list twice: Al Pearce’s Gang, The Aldrich Family, Bob Hope, Dr. Christian, Eddie Cantor, First Nighter, Frank Morgan, Guy Lombardo, Judy Canova, Kate Smith, Lowell Thomas, Major Bowes’ Original Amateur Hour, The March of Time, Mr. & Mrs. North, Mr. District Attorney, One Man’s Family, People Are Funny, Red Skelton, Rudy Vallee, Screen Guild Theater (Players), Take It Or Leave It and Truth Or Consequences. And so it went - from Music to Comedy to Drama to broadcasting history - the three eras of Network Radio's Golden Age.